Today would have been my mother's 81st birthday. Would have been. 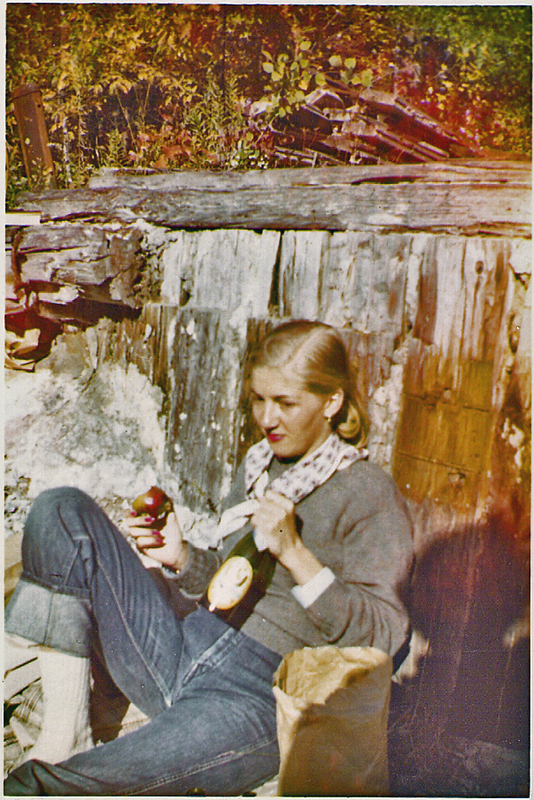 Since she's no longer here to celebrate with nine times nine candles, I have to remember her here, eating an apple, sometime in the 1950s, when she was in college. I've always liked this picture - the red in the foliage, the red apple, the red red lips, the red fingernails. The grey of the wood fence / rock wall matching the grey sweater. The oh so turned up jeans. Jeans! The dorky socks. The bottle of wine, clutched in her hand, the open brown bag it came from. Who took the picture? Is it the photographer's shadow at the lower right? What kind of shoes is she wearing? Where are they? Happy birthday, Moky. I'm sorry you can't tell me the answers to all of these questions. How beautiful - could be a book illustration. You look like her in a really lovely way. Hugs to you. Lovely photo, and yes I too see the resemblance. Also with your daughter. Those are bobby socks. She was probably wearing saddle shoes. And what a beautiful shot and memory. I hope my daughters remember me like this.